Garage doors keep your things safe and protect your home. But when they don’t work properly — when your garage doors don’t go up, don’t go down or suddenly get stuck midway — it’s more than an inconvenience; it’s a home security issue. Garage door repairs cost a lot of money, but you might not be aware that they don’t have to be. In fact, we show you how easy and inexpensive it is to repair and maintain the garage doors on your home yourself. These tips and ideas help you learn how to complete garage door maintenance and perform repairs in a single afternoon. Our tips demonstrate that many garage door issues result from dust, a lack of lubrication or routine wear and tear. 1/ How to make your noisy garage door quiet again? Let’s face it, no one wants a squeaky, screechy garage door, especially when they come home late at night. Neighbors get upset when they wake up in the middle of the night because of a loud garage door next door. The good news is performing regular maintenance, and replacing worn parts, solves most garage door noise problems. The first thing to look at if you have a noisy garage door are the nuts along the door and the track. Tighten nuts along the door and track with a socket wrench or adjustable wrench and make garage doors quiet again. 2/ How to deal with roller noise? Your garage door is made up of many moving parts, which cause noise as they wear out. Garage door rollers make noise as well. Most garage doors include five sections and each section uses rollers to operate smoothly. Older garage doors used metal rollers, which became squeaky over time. Buy nylon over metal rollers when it comes time for replacement. Nylon rollers cost more, but they save you money over time by lasting longer and requiring less maintenance. Measure your current rollers before buying new ones even though most are of a standard size. Garage door roller replacement takes only about an hour to complete and the result is like having a whole new door. 3/ Is your garage door frozen? Here’s what to do! When it’s cold outside, that’s when you rely on your garage door the most. It’s so convenient to stay in your warm car and drive right into your garage. But freezing temperatures cause mechanical devices like automatic garage doors to fail. If your garage door is stuck due to the cold the first thing to do is stop trying to force it by continuing to hit the button on the remote. Garage door motors burn up easily when they’re overused and not working properly. A burned up motor costs a lot to repair. Use a deicing product to get your garage door moving again if it’s affected by the cold. Buy deicing products at your local hardware store. Ice stops garage doors from opening and closing too. Use a heat gun or hair dryer to melt ice that’s impeding the door from working properly. Put down salt to melt the ice that’s causing your garage door to stick to the ground. Keep salting the area throughout the winter so the door moves freely. Also, be aware of any water that’s leaking and causing your door to freeze to the ground when the temperature drops. 4/ How to deal with broken glass? A broken pane of glass in your garage door is a huge safety and security issue. Bees and hornets like to make homes in cool garages during the summer. Also, small people fit easily through broken garage windows and gain access to your home when you’re out. Replace your broken glass as soon as possible. To replace your glass, first remove the broken pieces using pliers, and wear thick gloves to prevent cuts. Next, take a putty knife and remove any glazing keeping the window in place. Measure the opening and cut a pane that’s a little smaller than the hole. Once cut, fit the new piece of glass in the opening and use window glazing around the frame to secure the glass. Once your glazing is set, and has been smoothed out with a putty knife, let it dry and paint over it to match your garage door’s color. It’s a fact that most homeowners go in and out of their homes through their garages, and it’s essential their garage doors work properly every time. People spend thousands on fancy doors, but the doors don’t work well without little remote that activates them. When you press the button, and the garage door doesn’t open, try these fixes to the problem. Check the level of battery or charge. Many openers get power either via replaceable batteries or from a built in rechargeable battery. These batteries last for months, but they do need replacing now and then. See our guide about these best garage door opener. Another thing to check is the signal. Most modern garage doors operate with radio waves and these radio waves have a range limit. Also, interference affects radio signals too. Are you using your remote close enough to the receiver? And if so, is interference causing the door to not open? Interference and improper distance cause garage door failures all the time. As your garage door goes up and down the hole in the hinge where the roller stem sits will wear out. It’s a good idea to inspect these holes every month or so and replace the hinges if you see the holes looking more oval than round. The old saying “an ounce of prevention is worth a pound of cure” applies to garage doors too. While it might seem like a pain, regular maintenance keeps your garage doors operating smoothly, and prevents disasters. 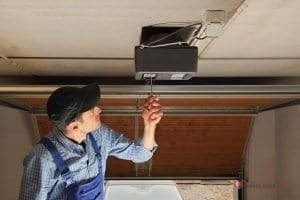 The first thing to do when you get a new garage door installed is to get used to how it’s supposed to sound and operate; that way you’ll know right away when something is not right simply by the way it sounds and moves. Every week or so, inspect the garage door’s track. Bits of dust, dirt and debris get on the track and impede the garage door’s movement. This causes problems down the road as the motor works harder leading to a premature burnout. Lubricate the track as you inspect it. Lubrication keeps parts running smoothly and prevents corrosion. Also, most experts recommend replacing the door’s rollers at least every seven years if not sooner. Brackets become loose during routine operation. Check for loose brackets during your maintenance exam. Tighten loose brackets with a adjustable wrench or socket wrench. And lastly, examine the door. Check for warping and water damage if you have wood garage doors. Also, examine the weather stripping for any signs of decay and replace them as needed. Your garage door is vital to your home’s security and with it being the primary means by which to enter and exit your home, it’s a convenience that most people couldn’t stand to be without. 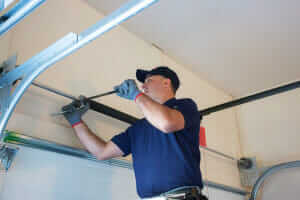 Take care of your garage doors with regular maintenance. Keep them running smoothly for years with regular repairs and maintenance without needing an expert to come in for expensive fixes. Even if you don’t consider yourself handy, following these tips, and performing some simple tasks, help you identify and fix small problems before they become larger and more expensive. Thanks for the heads up that a person should stop trying to force their garage door open or closed through using their remote in case their automatic garage door gets stuck in freezing temperatures. In my opinion, one should ask a local repair service to thaw it. Doing this will help extend its lifespan in the process.